This 11-day itinerary features a mix of city, mountain, and sea – a perfect adventure for the whole family! You will split your time between Marrakech, the Atlas Mountains and Essaouira, and we have included a few ‘free’ days so that you can explore the sights at your own pace. On your arrival at Marrakech Menara Airport, you will be chauffeur driven to your accommodation in the city. Check in and refresh at Riad Demeures d’Orient. Full day guided tour in Marrakech – At 9h30 AM; your guide will meet you at the hotel for Full day guided tour of Marrakech to visit all the important monuments. 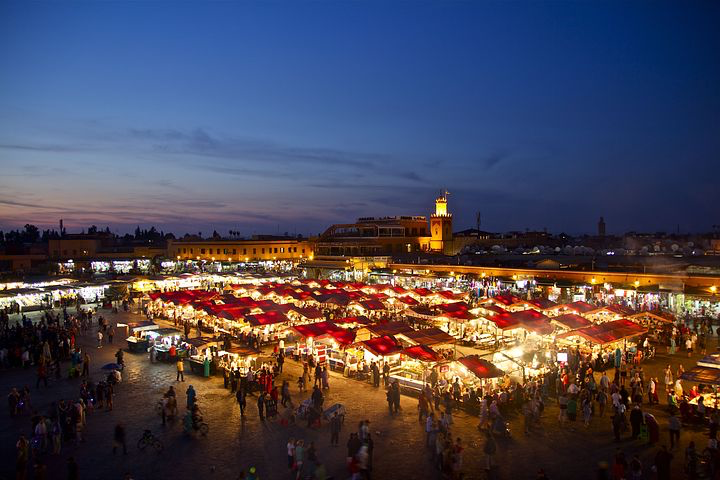 Marrakech, founded over 1000 years ago, is also known as the “red city” and is perhaps the most famous town in Morocco. A combination of the old (the Medina) and the new (Guéliz), Marrakech is an exotic cocktail of sights and sounds. There are many historical places of interest to see including and the extraordinary Jemaa el-Fna, the main square in Marrakech. In the evenings, the square becomes a venue for alfresco eating and entertainment with troupes of costumed acrobats, storytellers, magicians, dancers, and semi-mystical Gnawa musicians. 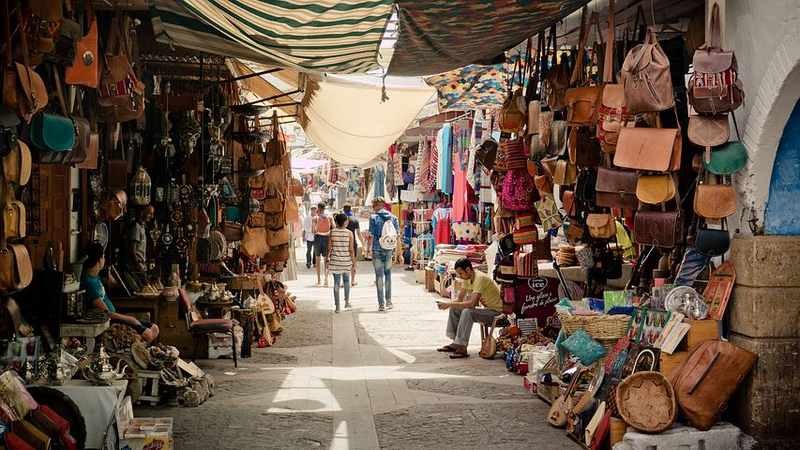 The souks offer a vast array of merchandise & provide an insight into a way of life unchanged in centuries. The “new town” Guéliz, built by the French in the 1930’s, is a total contrast to the Medina with its broad avenues, modern shops, and cafés. The most visited site in Guéliz is the “Jardins Majorelle” created by Yves St Laurent. A haven of peace set in an exotic garden. The Square, Jemaa el Fna, Jemaa el-Fna, translated as the Square of the art, is the main open space in Marrakech, and as old as the city itself. Once the scene of public executions, it is now the city’s cultural epicenter, thronged day and night with a carnival of local life, including snake charmers; dentists; scribes; herbalists; and beggars. In the evenings, the square becomes a venue for alfresco eating and entertainment of a bizarre nature with troupes of costumed acrobats, storytellers, magicians and semi-mystical Gnawa musicians. 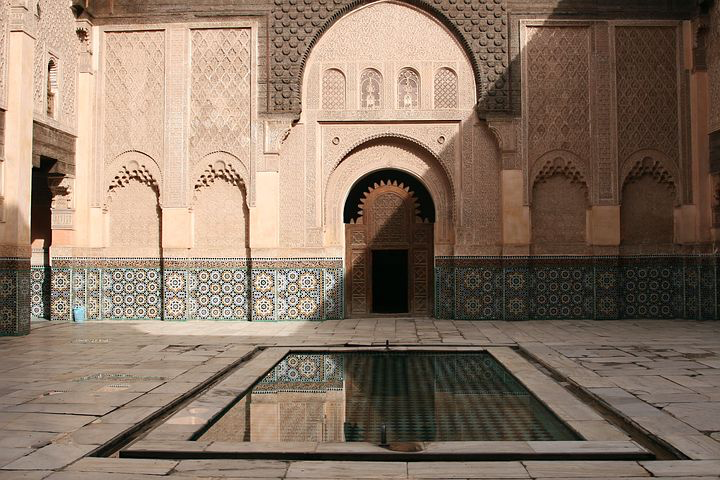 Saadian Tombs, One of the most visited sites in Morocco is the Saadian Tombs which were only accessible via the mosque next door. However, in 1917 they were opened to the public and can now be accessed via a narrow passage that leads to an enclosed garden watched over by two mausoleums that include more than one hundred mosaic decorated tombs. Koutoubia Minaret, the center piece of Marrakech is the square tower of the Koutoubia minaret, attached to the Koutoubia Mosque, built in the late 12th century. It’s not particularly high—about 250 feet—but it towers over the Medina thanks to a long-standing planning ordinance that forbids any other building in the old city to rise above the Koutoubia. 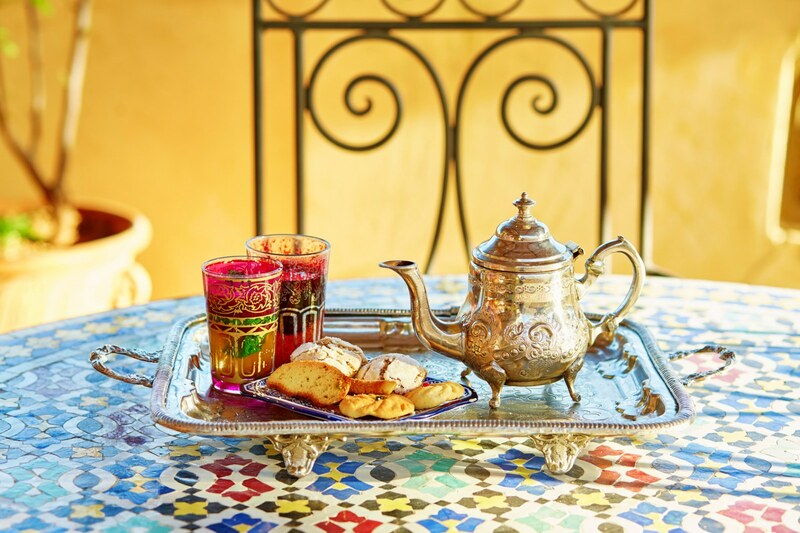 Breakfast at your hotel then continue your guided exploration of Marrakech. 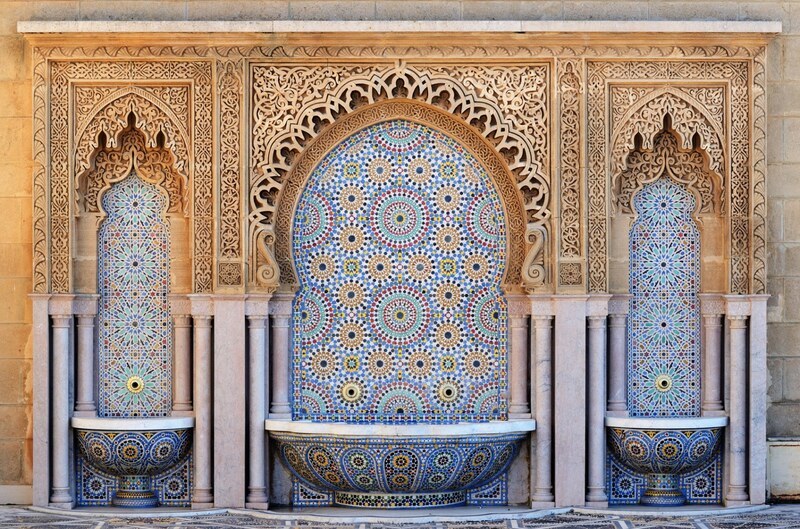 El-Bahia Palace, This 19th century palace is elaborate in its decoration and was built over a period seven years for Ba Ahmed, the son of the Grand Vizier Si Moussa, there are row after row of apartments—that once housed Ahmed’s harem—a trapezoidal garden, a huge tiled courtyard, and many hidden treasures, both in the form of antique objets d’art and the palace’s convergence of Andalusian and Moorish architecture. The Souks, At the heart of Marrakech, filling the alleys north of the central square, are the souks, mile after constricted mile of tiny, closet-sized emporia. The sheer number of shops is overwhelming—100 of them in 100 yards. Every section of the souk has its specialty, with alleys devoted to everything from spices and ironwork to the ingredients necessary for casting magic spells. The botanical gardens of Majorelle, property, acquired in 1922 by the painter of the same name and then bought and developed by Yves St Laurent. These gardens are an oasis in the heart of the city and rich with flora and fauna. Once inside the garden walls, you would never think you were in the center of a busy city. The garden of “La Menara”, and its hundreds of olive-trees, the park extends for over a hundred hectares (280 acres approx) and has in its center an immense pool dating from the XIIth century. At the water’s edge is a small Saadien house that has been restored. All the gardens offer excellent photographic opportunities. For dinner you are free to dine at a restaurant of your choice, or we can reserve a table for you at one of our recommended restaurants. Enjoy your day at leisure in Marrakech. Your driver & guide is at your disposal. This morning, transfer to Imlil, approximately 1 hour & half driving. You will stay at Kasbah Du Toubkal on Half Board basis. There are many walking opportunities available to you and we can offer guided treks around the local valleys and villages. 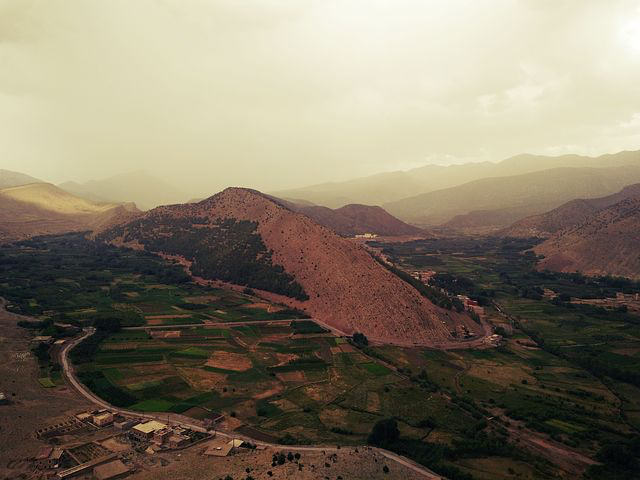 Today you will enjoy a full day of trekking with guide and Lunch included in the Atlas Mountains. Dinner is at your hotel. Enjoy a day at leisure. Your driver & guide are at your disposal. 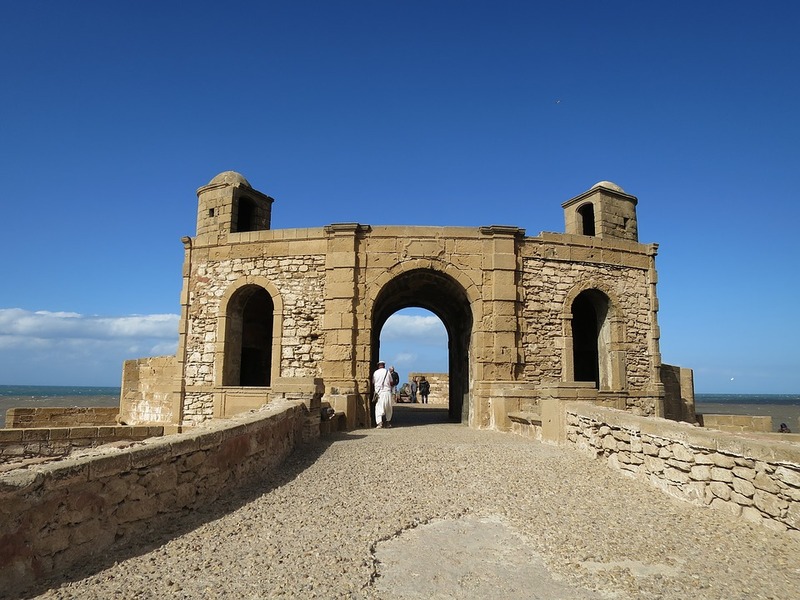 Head to Essaouira by private car & driver, approximately 4 hours. Essaouira, the coastal city, this magical fortified coastal town is in total contrast to Marrakech and offers many photographic opportunities. 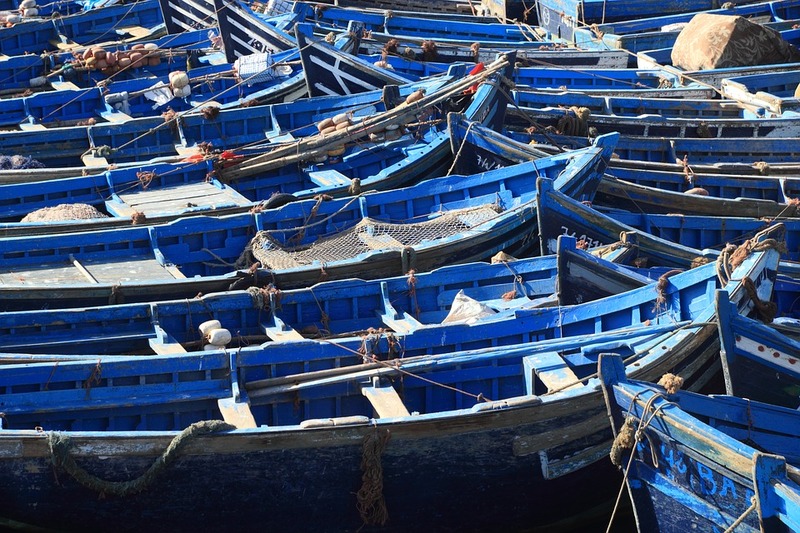 A guide will meet you and take you on a tour of the lively port, the colorful souk and the medina of Essaouira. For lunch, you may wish to eat at one of the many fish stalls near to the harbor where the morning’s catch is on display and cooked right in front of you. Check in at Sofitel Mogador & Spa in Essaouira. Rest of the day to enjoy the hotel and its facilities. Following breakfast our local guide will meet you and take you on a tour of the lively port, the colorful souk and the medina of Essaouira. For lunch, you may wish to eat at one of the many fish stalls near to the harbour where the morning’s catch is on display and cooked right in front of you. In the afternoon you can go out of the town into the surrounding countryside. On your return to the Hotel we recommend you dine at one of “ Le Chalet de La Plage” one of the excellent restaurants in Essaouira. After dinner, you may wish to return to the Medina and enjoy a drink on the roof bar of the Taros Café Restaurant where local musicians play relaxing blues and jazz music. You have the day at leisure to enjoy the facilities of your hotel & Spa. For dinner, we suggest dining at “Chez Sam,” a world-famous fish restaurant at the end of the harbour. This Riad in the heart of the Medina of Marrakech is a balanced mix of Morocco and Italy. A large Riad with 10 air-conditioned suites each with its individual style. The property features a Hammam and Jacuzzi as well as a large pool. There is a massage room. There are indoor sitting areas as well as indoor dining. The roof terrace provides excellent sun bathing opportunities and there is a roof top bar. The dining at the Riad is excellent as is the service from a very friendly staff. Demeures D’ Orient is pure luxury and a very highly regarded property. The Kasbah Du Toubkal is an extraordinary venture, the product of an imaginative Berber and European partnership. There is a shared belief that the beauty of the Toubkal National Park should be accessible to all who respect it. 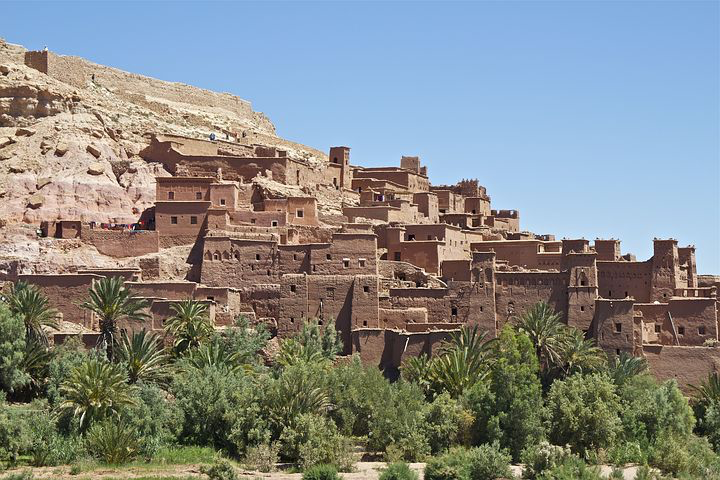 To this end the Kasbah has been transformed using traditional methods, from the home of a Feudal Caid into an unprecedented haven; one that provides a variety of accommodation and even possibilities to meet differing requirements. The Kasbah is a welcoming environment for those seeking comfortable mountain refuge, and for those who wish for superb rooms in a stunning setting. The Kasbah du Toubkal is not a hotel in the traditional sense; it is more an extension of the hospitality that stems from the home of the Berbers who run it. In this luxury hotel in Eassaouira, you will have a breathtaking Villa with private pool and garden and butler service. Overlooking the ocean in the heart of the resort of Mogador, Sofitel is the ideal place for a change of air in a luxurious, relaxed and welcoming environment. A perfect fusion of contemporary design with local culture souiri, this hotel in Essaouira will leave you breathless when you discover panoramic views of the golf course and the ancient Mogador island namesake. Come and experience the delicious culinary adventures, musical and spa. The hotel is located near the golf course designed by Gary Player. Free shuttle bus to Essaouira’s medina and the beach.